The UP College of Medicine began as the Philippine Medical School?. It was built in 1905 at the former Malecon Drive (now Bonifacio Drive). In 1910, it was integrated as one of the colleges into the University of the Philippines and was renamed to U.P. College of Medicine and Surgery. The name was later shortened to the University of the Philippines College of Medicine. 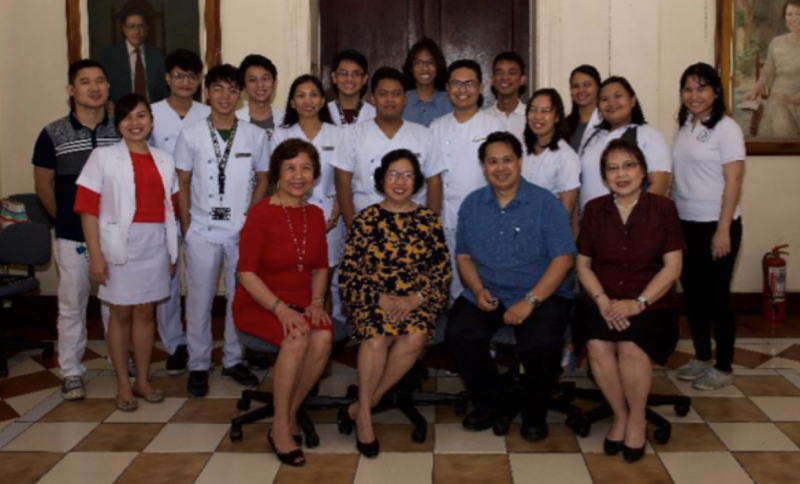 Its first Dean was Dr. Paul Freer, while Dr. Fernando Calderon, an alumnus of the University of Santo Tomas Faculty of Medicine and Surgery, became the first Filipino Dean of the College. The Fernando Calderon Hall is the main building of UP College of Medicine students. Named after the first Filipino dean of the college, the building was transferred from Bonifacio Drive to its current location in Pedro Gil Street, Manila in 1910. The Calderon Hall and the University of the Philippines College of Medicine was the only UP unit that was open and functioning during the height of the Second World War, to provide medical services needed during that time. After the War, the building was rehabilitated in 1951 under the leadership of Dr. Agerico Sison. 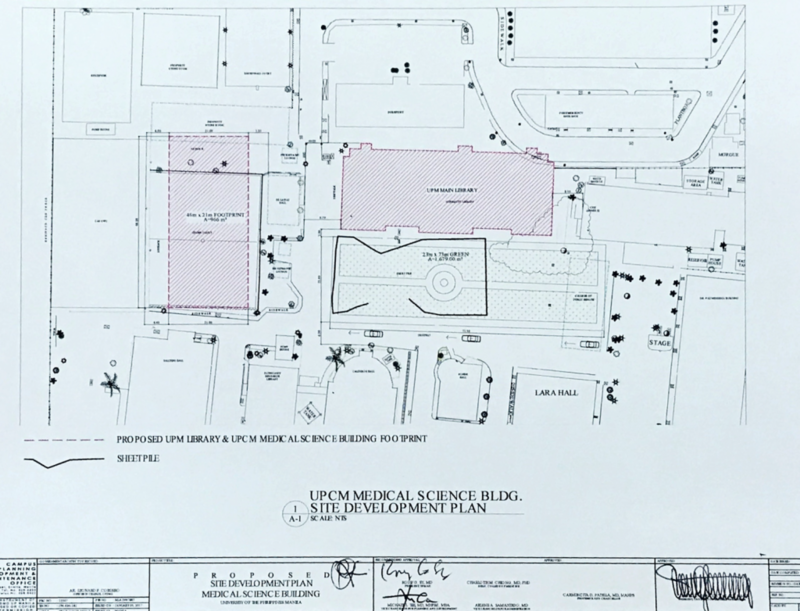 It is unknown to me when the Basic Science Lecture Rooms were built but after serving for so many years groundbreaking for a new Academic Center occurred on April 11, 2016. UPMASA has committed to fund the First Floor Auditorium. UPMASA committed to ensure that Medicine is taught in facilities conducive to the education of the Filipino Physician in the modern world. Many alumni have supported . It is my great expectation that every Alumni share a legacy of being part of a new edifice to enshrine a connection to a beloved Alma Mater. 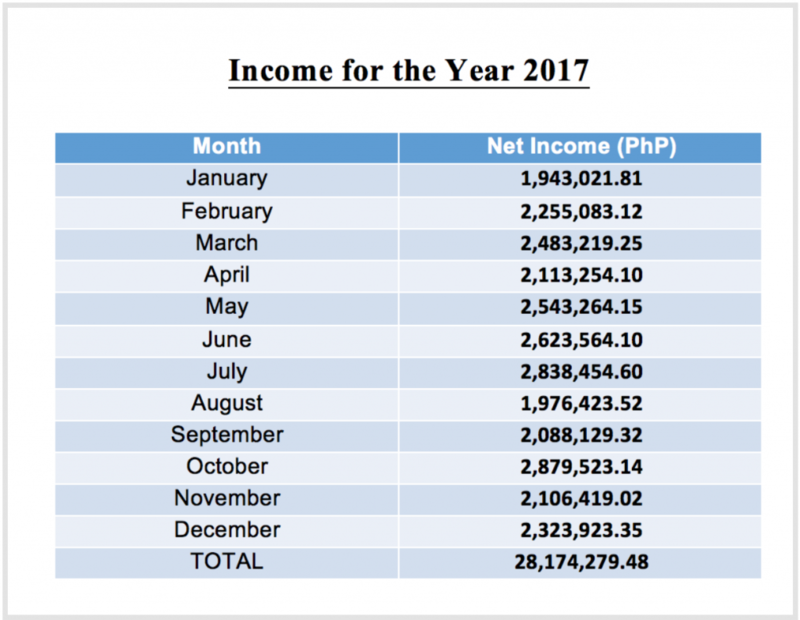 Every cent or centavo will count. This is our Alma Mater. We appeal to your generosity. UPMASA will acknowledge your donation to the First Floor Auditorium with your names enshrined with the the following named plaques. The above scheme is for a single individual donating the entire respective amount. That Classes, Chapters,and other Groups shall have only the name of their group listed if???? their donation is made up of donations from individual members. We know how proud we all are as Alumni of the University of the Philippines College of Medicine. Let us show we care and carry on this project to fruition! 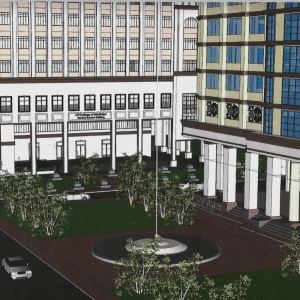 There are changes again regarding the Medical Sciences Building. Due to presence of electric post, drainage lines and IT lines close to or going across the designated site besides the new library building, Pres. Danny Concepcion agreed to proposal to “rotate” the MSB with it facing east (towards Taft Ave) rather than facing south as originally designated (towards Pedro Gil St.). 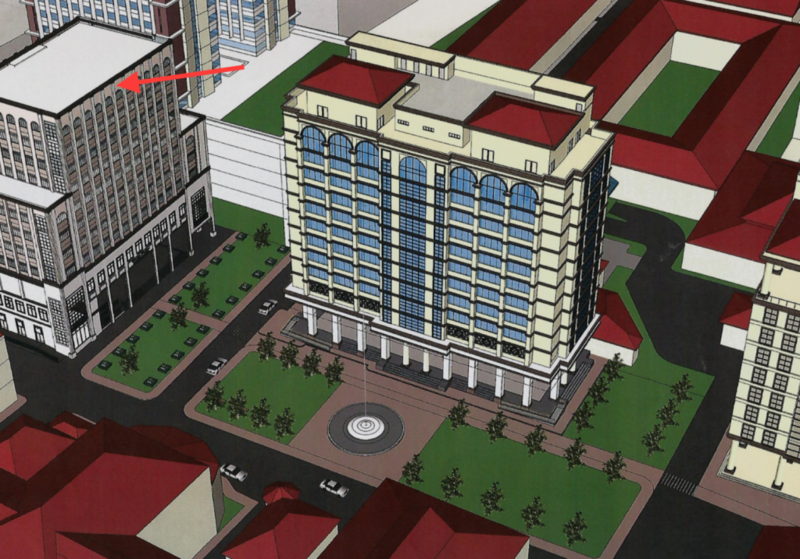 Previous (Above) and current (below) perspectives of the location of the MSB and library. The picture shows the front view of MSB at the background. 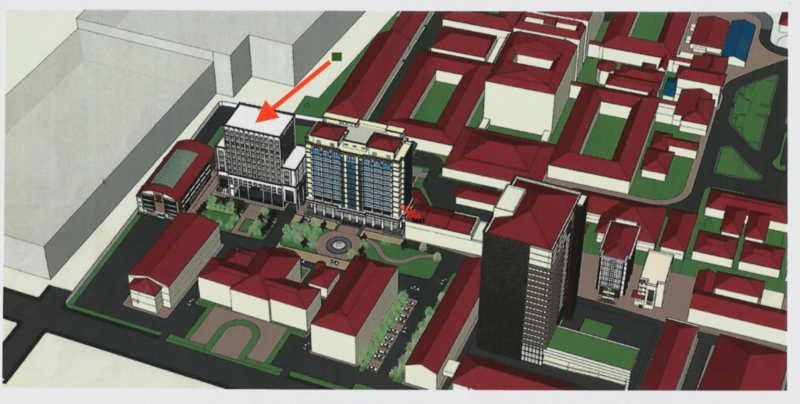 MSB will still be an 11-storey building. There will be minimal change on available rooms presented to UPMASA last July. I will review and send this to you soon. Dean Charlotte Chiong is planning a ground breaking activity on Oct 22 if all concerned (esp. Pres. Concepcion) will be free to attend. The Board of Governor’s meeting during the 2012 UPMASA Alumni General Convention (AGC) in New York City set the stage for one of the most expensive, most ambitious and challenging undertakings of UPMASA. As was customary in the AGC Board meeting, we had invited as our guests, the outgoing Dean of the UPCM, Dr. Bert Roxas, the new Dean, Dr. Agnes Mejia, the new Chancellor, Dr. Manny Agulto and the Director of PGH, Dr. Jose Gonzales (or Joe Gon, as he wishes to be called). Each one was allowed to give a few remarks and when it was Joe Gon’s turn, his remarks struck a funny chord in me ……. 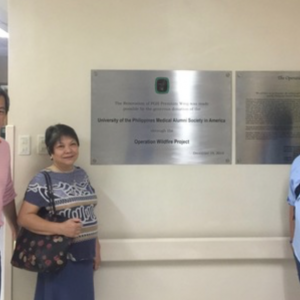 PGH utilizes its pay ward to generate revenues for the charity patients”. My thoughts immediately flashed back to 5 years ago when I visited a friend who was admitted to the PGH pay ward for slipped disc surgery. The “private” room he occupied was dismal. The wall paint was faded and peeling, a section of the ceiling had a gaping board, the toilet and bath were poorly maintained and the faucet was leaking with a pail of water underneath to catch the incessant drops that fell. I murmured to myself, “How can PGH attract paying patients with such accommodations, notwithstanding that there are far better private rooms in hospitals elsewhere?” I asked my friend why he decided to have his surgery at PGH and he replied, “It’s because I trust the doctor”. With this thought in mind, I stood to interject a constructive criticism to Joe Gon, “PGH pay ward will not attract paying patients to the hospital unless something is done to improve the physical condition of the private rooms”. However, my comment was cut off from any discussion by the Chair because he felt that I may be “opening a can of worms”. So, I quietly took my seat and held my peace. Late that afternoon, while waiting to board the boat for the UPMASA fireworks cruise, lo and behold, here came Joe Gon. So I told him again that I meant what I said and surprisingly, he agreed with me. However, although he was aware of the need to renovate the private rooms of PGH, it was not priority due to the limited funds available. I asked him how much it would take to renovate the rooms and he replied, roughly $5000 per room. I offered to sponsor a room and asked Offie Bernabe and Necita Llorin-Roa, who were with me, if they would like to do the same. Their affirmative responses gave us encouragement. On the way to the boat, Francis Sy joined in among the responders and while on the boat, Manny Dalope pitched in. The next day, more pledges came in during the alumni luncheon meeting and the list started to grow, thereafter. At the gala night, Offie volunteered to help in the solicitation while early morning the next day, my lovely classmate (Class ’65), Mariflor Suarez-Jamora was all excited about the project and suggested that we should go further than just room renovation. We should have a nice reception/lounge for the patient’s family and friends who are visiting, a one stop shopping service – admission, laboratory, cashier, etc. all in one place plus adequate parking! I recoiled at the thought of her suggestions. What I initially envisioned as a simple room renovation has now turned into a very ambitious undertaking! But Mariflor is such a determined and persuasive person. So we approached Joe Gon with her grandiose ideas and he agreed to support them all. 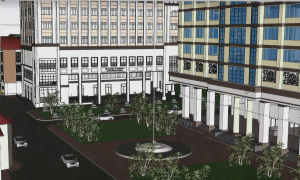 In fact, he said that plans are already in place to build a new parking structure for PGH. Thus, the AGC ended for me with a project that started as a wild spark and ended as a Wildfire! I invite you to get consumed in the flames of this ambitious undertaking. It is a win-win situation in many aspects: (1) Your $5000 donation will sponsor a room renovation. In appreciation, your will have naming rights and the room will be named after you, as donor and/or in honor of your loved ones (e.g., parents, spouse), (2) your donation is tax deductible, (3) the renovated room will generate income, which is uncommon in many of UPMASA’s donations and will be used for room maintenance and in large part for the indigent and PGH charity patients, (4) the project will improve service and efficiency in the pay ward, and (5) your support will help in PGH’s continuing mission to serve the underserved. There have been reservations expressed by some, based on past experience, that their donation might not be used for the intended purpose. As chair of the UPMASA Project Coordinating Committee which supervises and monitors all UPMASA donations, I give you my pledge of accountability – your donation will be used only for this project. To close, we pray that the trickle of water that still drips from the leaky bathroom faucet will swell into a raging river that will wash away your doubts and hesitation. You can make a one time payment of $5000 or the option of 4 easy payments of $1250 every 3 months. Please make your check payable to UPMASA with memo “Operation Wildfire” and mail to UPMASA Treasurer, Dr. Rolando Perez below. Medical missions help rural areas with needed medical care. UPMASA collaborates with UGNAYAN ng PAHINUNGOD and other non-profits in delivering medical, surgical, and obstetric care into far-flung regions of the Philippines. Are you up for an adventure? Join us. 1992 – 93: initiated by UPMASA New York-New Jersey-Connecticut chapter. Among the prominent advocates and supporters: Dr. Paulino Cruz and Dr. Miriam Cosca-Cruz, Dr. Emmanuel Lat and Dr. Zenda Garcia-Lat, Dr. Bienvenido Jongco and Dr. Anita Ortega-Jongco, Dr. Geraldine Gomez-Pinder, Dr. Lulu Ramirez-Plurad and Dr. Arthur V. Plurad, Dr. Marilyn Aldeguer-Resurreccion and others. 1995 -Partnership and collaboration with the Ugnayan Ng Pahinungod-Manila. Single Target Mission Action areas: 1995, 1997. Double (back to back) Target Mission Action Areas: 1996, 1998, 1999, 2000, 2001. Dr. Lulu V. Ramirez-Plurad (chair, 2001 – 2003) and Dr. Marilyn S. Aldeguer Resurreccion (chair, 2004- 2005). 2002: Start of UPMASA funding support. Increasing number of volunteers and increasing number of patients treated in target areas. Partnership established with Catholic Medical Missions Board. Pototan, Iloilo (2005) – the only exception target Area – Solo UPMASA only; no volunteers from Ugnayan Ng Pahinungod. Dr Frances Tolete-Velcek (Chair 2006-2009), was assisted by energetic movers. Iman and Zenda Lat, coordinated the following target areas: 2006 (Gingoog), 2008 (Baroy), and 2009 (Hilongos). 2007 (Tuguegarao) was actively coordinated by Elsie Antonio. 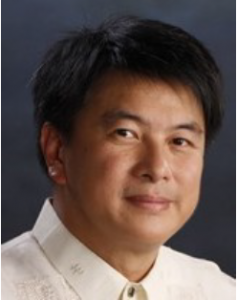 Dr. Valentin N. Dolorico (chair, 2009 -2017): Increasing Medical, Nursing, Dental Volunteers and Non-Medical Volunteers. 2014: Dipolog Medical Action- Partnership with Univ of the East Ramon Magsaysay Medical School Alumni. 1995 – 2001: NY-NJ-CT chapter funding support + individual fund raising. 2002 – Present: UPMASA funding support for medication, supplies, some equipment and Pahinungod expenses. 90% of expenses covered by individual and chapter fund raising (exceptional fund raiser: Dr. & Mrs. Valentin D. Dolorico 2010 – 2017). Pahinungod: Cebuano term closest to Oblation = offering or sacrifice. Volunteers are known as Pahinungods. Currently most active: Pahinungod Manila (for Health care, Street Kids and 8 other active programs) and Pahinungod Los Banos (for Agriculture). 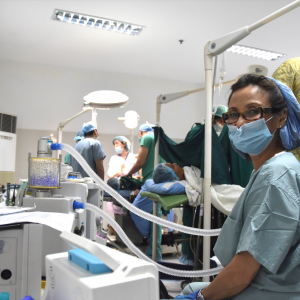 Pahinungod Manila annually does 15 – 40 medical missions within the Philippines. 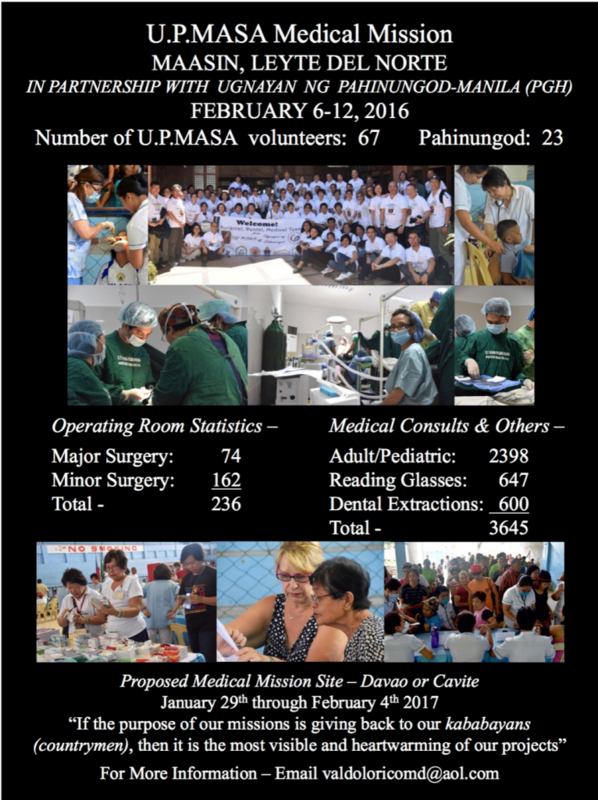 UPMASA coordinates/joins one medical mission with them. Provides surgical volunteers and liaison to dental and SUKOB (eye) volunteers. Do some on site pre Mission patient screening and some Post mission surgical follow up. Very active participation in surgical procedures during UPMASA medical missions. Assists in Philippine licensure fulfillment (temporary or permanent) for USA UPMASA volunteers. Oriental Mindoro Association of California (OMASC) (2013): liaison to local government provided surgical gowns and drapes, food for volunteers, hospital cots for post op Medical mission patients. Divine Mercy Society (Texas) (2017) – medications, non-medical activity. Memorandum of Agreement between: UPMASA medical Chairperson, UP Chancellor Manila (for Pahinungod Manila) and local government (for local budget for food, local transportation, mission site [operating rooms, clinic areas, restrooms, lodging areas, security]). Consent and participation of local government is imperative. Consent and involvement of local health MDs and officials for patient selection and follow up (only indigent patients to be seen and treated by mission personnel so there is minimal impact on local practitioners’ income). USA presence of a Target Area representative [coordinator] (preferably UPMASA member). Coordination with Pahinungod Manila for purchase and transport of supplies to target area; and post missions expeditious referral to PGH of complex cases. UPMASA funding support, robust fund raising and expense control. Day 0: Arrival of US Volunteers in MNL. Transport of Supplies from MNL to target Area. Day 1: Arrival of US Volunteers + Pahinungod Volunteers in Target Area. Sorting of Supplies, Final Surgical screening. Surgical procedures start in the PM. Day 6: Post mission conference (preferable with local medical personnel); Repack/transport of supplies back to MNL. Rest & recreation (near target area) for all volunteers. Day 7: Return to MNL. Many UPMASA and USA volunteers ship supplies and equipment for medical Mission Use: Ship to: Ugnayan Ng Pahinungod, Mezzanine Level, Philippine General Hospital, Taft Ave, Manila. Donate to Medical Missions: www.upmasanational.org Click on donate, click on medical missions. The UPMASA is a qualified 501 (3)© organization. Donations are tax deductible as allowed by law. To Join: contact Medical missions chair: www.upmasanational.org Click on medical missions. Explore preventive measures to decrease or eliminate goiter and hernia incidence (most common general surgery cases); and cleft lip/cleft palate (common pediatric plastic cases). Establish relationship with local MDs for continued surgical education and collaboration during mission days; and continued medical education in coordination with UP-PGH. Explore ways to prevent chronic medical conditions. Stronger association with other charitable groups for treatment of complex medical and surgical cases e.g. Handog Ngiti. 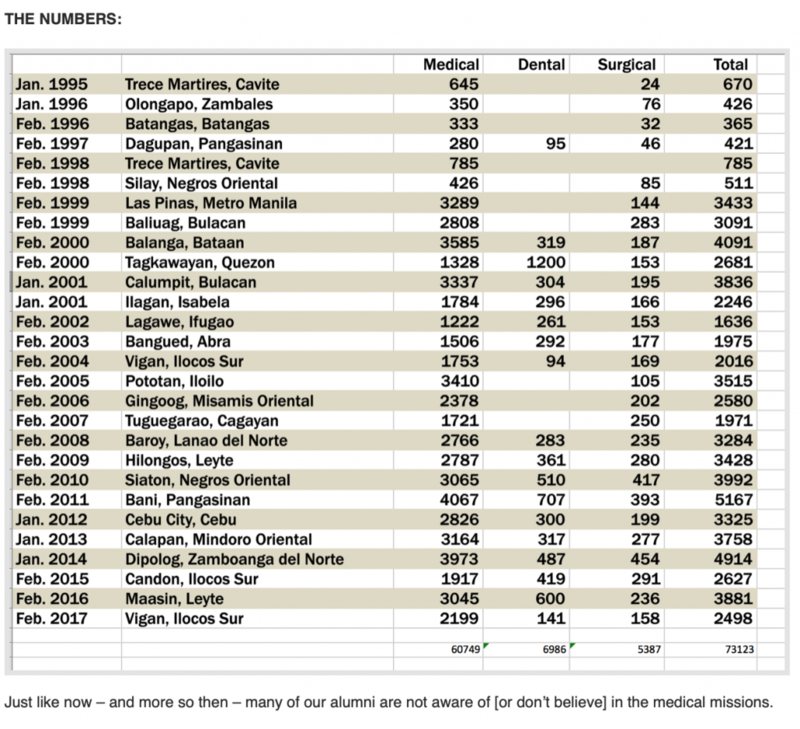 73,123 cases since the Medical Mission’s inception. 5387 surgical cases. 6986 Dental & 60,749 medical consultations. The numbers are staggering. These patients touched our lives and tagged on our Missioner’s hearts to keep going back. Local Practitioners resent medical mission activities especially if pay patients are seen by medical missions. UPMASA medical missions take great pains to do preliminary screening so indigent (charity patients) are the major beneficiaries. The most productive, rewarding and successful missions usually meant several target mission area visits by the coordinator and/or the chair; and the involvement of the mayor, governor and congressman/congresswoman of the target mission area. Active and current Philippine Medical license required especially of surgical personnel. My preference is to perform orthopedic procedures with the local orthopedic surgeon (for better pre-OP evaluation and long term Post OP patient care). 1. In 2005 there was a trifold piece paper (color – light green) incorporating data from the medical missions (1995 – 2005). This was prepared by Marilyn Aldeguer Resurreccion (then the Med mission chair) for the 2005 AGC. (Just like now – and more so then – many of our alumni are not aware of [or don’t believe] in the medical missions). 2. The July 2010 AGC souvenir program (published by the Northern Calif chapter) : has the tabulation data incorporating the above data and tabulation made current up to 2010 (Siaton) with Bani as the proposed 2011 target area. If you are a surgeon or anesthesiologist joining the medical mission (working in the hospital), you will need an STP (Special Temporary Permit) or you can renew your original license when you took your board exam for a permanent 3 year license. If you intend to go on missions regularly or travel to the Philippines (PHL) for an extended time, I advise you to renew your old license. If you are joining as a medical doctor (internist, pediatrician, family practice, etc.) they have not required a PHL license unless you will be working within hospital premises. It is still advisable to get a permanent one, it is not expensive. Log on to www.professionalr regulatory commission and click on Special Temporary Permits at the bottom of the left column. You can download the application forms. Ms. Jovel Dacumos (email: jovsdacumos14@gmail.com) coordinator for Ugnayan Ng Pahinungod in PGH will be able to assist you. You will have to send her the necessary documents and fees. This way you will avoid having to go to the PHL consulate and having them notarize your documents. It is an encouraging and heartwarming fact that UPMASA continues to attract donors to participate actively in the education of future colleagues. 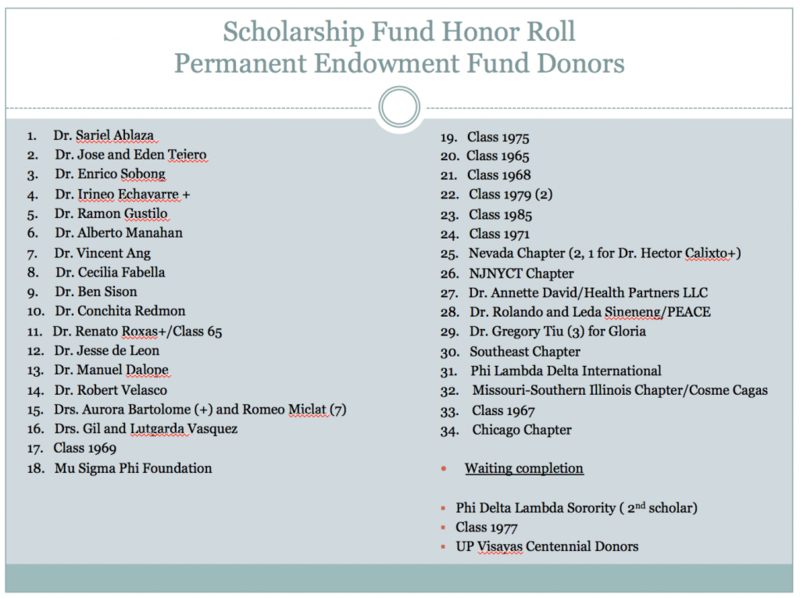 As classes, chapters or individuals, our alumni add to the roster of generous donors that I have now dubbed The Honor Roll. Last year, the Permanent Endowment Fund (PEF) received from the Phi Lambda Delta Sorority a grant that will have a scholar bearing its name in perpetuity. The Southern Illinois-Missouri Chapter has likewise completed, what was started in 2014, the $24K needed to start funding a scholar in their name in perpetuity. This year, the class of 1967, our golden jubilarians and Class of 1977, our ruby jubilarians have likewise made the commitment to PEF. We also continue to encourage the membership to use the UPMASA National Treasury as a conduit for their tax-deductible gift giving as Pass Through Donors. They stipulate their intent, can pick their own beneficiary, give a lump sum amount or remit yearly. 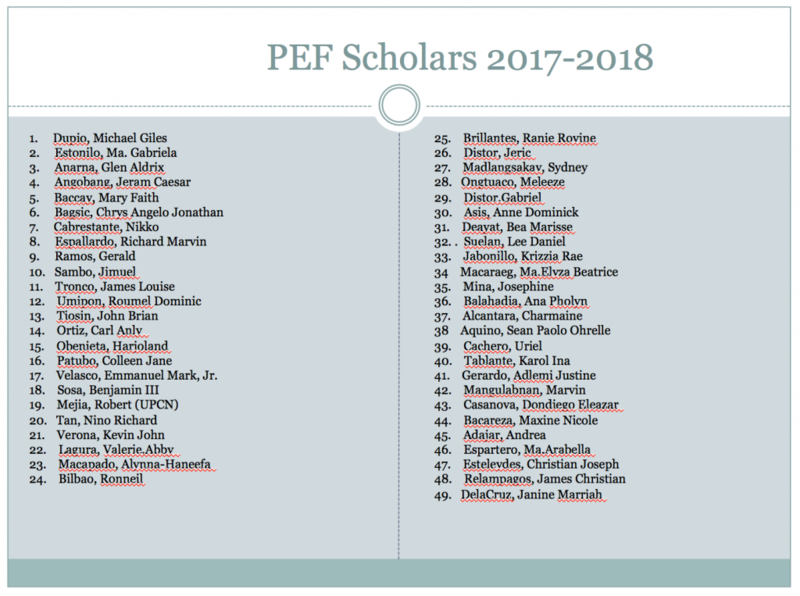 So far, many have matched the $1200 that PEF scholars receive and other bodies of the UP System have benefitted from this free service, eg. University of Visayas and the UP College of Nursing. This academic year, we are starting yet another new kind of funding ,a joint UPMASA-UPCM effort in which an alumnus donates $500 to the National Treasury and the UPCM matches with $700 so a scholar gets the annual $1,200 grant. Dr.Ching Redmon, past PEF Chair has come up with this idea and has kick-started by making the first donation. For this new plan,, a donor has to commit to sustain the grant for at least 5 years. Last, but not least, we are honored to have heard from Dr. Dahlia McKinney of Class 1997, a practicing hospitalist in Birmingham, Alabama. She sent a donation to honor her mother who was cared for by the PGH Palliative team. ”My Mom and I loved the way she was treated there despite the inadequate resources. I really would like to support the medical education of our doctors….”.Her donation is now part of the PEF General Fund. We welcome all donations, big and small. Please continue to support our students. They are the future: clinicians in the community or academic centers, private practitioners, public health advocates, researchers, teachers, and upright citizens. 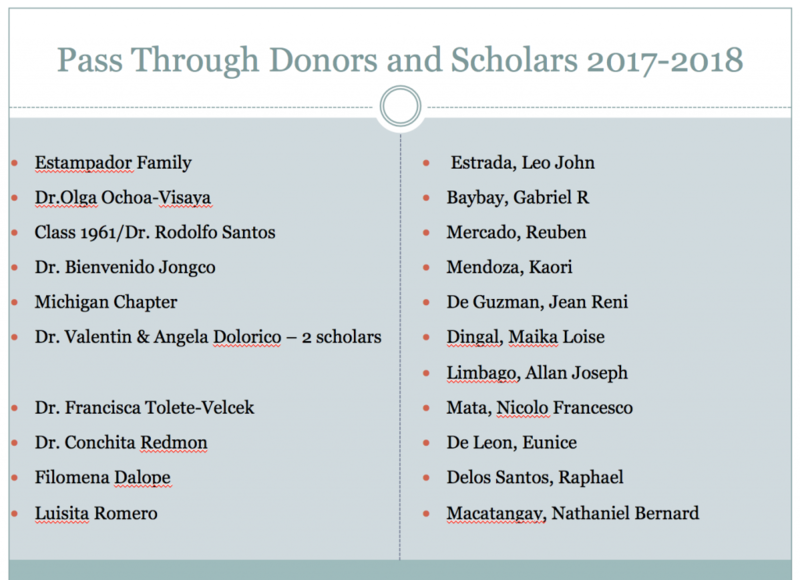 Following is the list of donors and their scholars for the Academic Year 2017-18. Imagine yourself, a poor parent of a child with a congenital heart defect. Your child can be cured but because you cannot afford treatment, your child ends up suffering from frequent respiratory infections, congestive heart failure, pulmonary hypertension, poor weight gain and failure to thrive. Your child wishes to play with the other children, but is not able to because he is always tired and weak. Due to frequent illnesses and hospitalizations, your child’s schooling is compromised, school grades are affected. He is a poor candidate for a future professional career and might have to live with you for the rest of his life. Or, he could die at a young age from complications. Long term medical treatment and repeated hospitalizations add to the financial burden of your family. 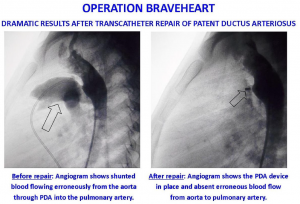 This is why OPERATION BRAVEHEART was conceived, an ongoing project that facilitates the transcatheter repair of indigent Filipino children’s Patent Ductus Arteriosus (PDA), Atrial Septal Defect (ASD) and Ventricular Septal Defect (VSD). Every month, 6-8 new cases of PDA’s are seen at the Out Patient Department of the Philippine General Hospital. A much smaller number of ASD’s and VSD’s are also newly diagnosed. 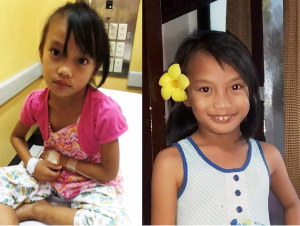 According to Dr. Jonas del Rosario, US-trained Interventional Pediatric Cardiologist and Con-sultant at the Department of Pediatrics, virtually all of these children are good candidates for transcatheter closure of their heart defects. They come from all over the Philippines but pri-marily from the Metro Manila area and surrounding provinces. Sadly, most of these children remain unrepaired for the simple reason that their parents don’t have the resources to pay for this life-changing intervention. The outlook for children who undergo repair is very promising. Because repair is curative, these children could live the rest of their lives like their peers. In the past, Open Heart surgery was the only option available for the repair of these children. This was performed by a cardiac surgeon in a specially equipped operating room. The pro-cedure was done under general anesthesia with 3-4 weeks recovery time. Currently, transcatheter closure is the preferred means to repair these children. The proce-dure which lasts from 1-2 hours, can be done in the Cardiac catheterization laboratory, with most patients tolerating intravenous sedation. A peripheral blood vessel is accessed in the groin where the catheter is inserted and threaded to the heart defect for placement of the de-vice. There is no chest scar and recovery time is only 3 days. The procedure is relatively safe with very low mortality and morbidity figures. The major cost of transcatheter repair is the $1,000 device that is implanted to seal the PDA ($2,000 for ASD or VSD). Another $500 may be needed for additional expenses including use of the Cardiac cath lab, surgical supplies, medications, nurses’ overtime and anesthesia. 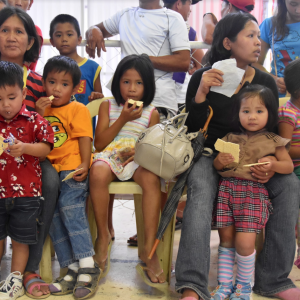 Dr. del Rosario, who pioneered transcatheter repair in the Philippines offers his professional services to repair these children for free, as long as the above expenses are covered. Candi-dates are referred to the Medical Social Service of Philippine General Hospital to determine their indigent status. Only charity patients are funded. After a year into the project, Operation Braveheart has so far facilitated the successful repair of forty one (41) children. Since new cases continue to accumulate, additional and continuous funding is needed to treat the newly diagnosed children. Thank you for supporting Operation Braveheart! 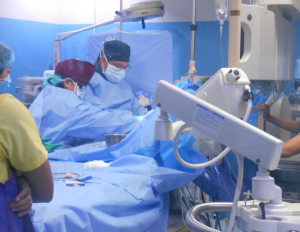 DR. JONAS DEL ROSARIO, our volunteer Pediatric Interventional Cardiologist, has so far repaired the congenital heart defects of forty one (41) indigent “Operation Braveheart” children. 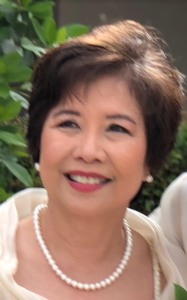 Dr. del Rosario, a 1991 UP College of Medicine graduate, trained in the United States for seven years before returning to the Philippines to pioneer the transcatheter repair of children’s “hole-in-the-heart” defects. He has performed hundreds of these proce-dures. Because of his dedication to these children he was honored as one of the “Ten Outstanding Young Men (TOYM) in the Philippines. Dr. Jonas del Rosario performing transcatheter repair in the Cardiac cath lab of Philippine General Hospital. Below are some of our repaired Braveheart children. The Cesium project is an on-going project spearheaded by the West New York Chapter. This helps in the maintainance and updating of the PGH Cancer Institute infrastructure as well as assistance with medical supplies needed for patient care. The PGH Cancer Institute is in need of disposable supplies such as gloves, syringes, needles, sutures, surgical tapes, etc. Most patients are indigent, and are unable to afford care. The Institute served 23,046 patients from January to July 2008 alone. Help us help others, donate now. Members: JOSE DAVID, M.D. Incumbent President, SUSAN ECHIVERRI, M.D. President-Elect, WILLIAM ROMERO, M.D. – Immediate past President (ex-o cio), RENATO MANDANAS, M.D. National Treasurer, MARIANO YOGORE, M.D. and LOU PUBLICO, M.D. Chairs of the PEF, GLENN BATILLER, M.D. Medical Missions, CECILE PASION-BREGMAN, M.D. Post-Graduate Education and Faculty Development, PATRICIO REYES, M.D. Research, Silverio Cabellon, Jr., M.D., Enrique Ostrea, M.D.